Prototype: Class G 2000 BB Vossloh heavy diesel locomotive with symmetrical cabs. Locomotive owned by the railroad service company RTS Rail Transport Service GmbH, registered in Germany. The locomotive looks as it did in Era VI. Model: The locomotive has a digital decoder and extensive sound and light functions. It also has controlled high-efficiency propulsion with a flywheel, centrally mounted. All 4 axles powered by means of cardan shafts. Traction tires. The triple headlights and dual red marker lights change over with the direction of travel, will work in conventional operation, and can be controlled digitally. The headlights at Locomotive Ends 2 and 1 can be turned off separately in digital operation. When the headlights are off at both ends, the "double 'A' light" function is on at both ends. The cabs have lighting and it can be controlled separately at both ends in digital operation. Maintenance-free warm white and red LEDs are used for the lighting. The locomotive has many separately applied details. The side handrails on the frame are constructed of metal. The locomotive has detailed buffer beams. Brake hoses that can be mounted on the end of the locomotive are included. End covers are included and can be mounted on the buffer beam. Length over the buffers 20 cm / 7-7/8". A set of side dump cars for the firm RTS to go with this locomotive can be found under Märklin item number 48457 along with information about the required DC wheel sets. 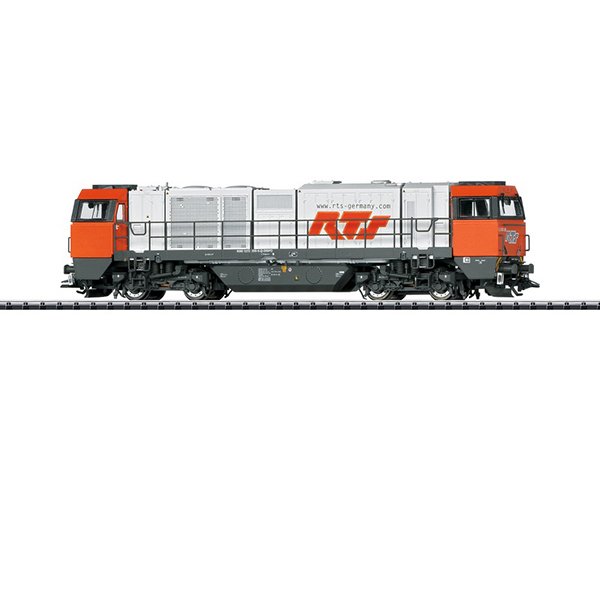 This model can be found in an AC version in the Märklin H0 assortment under item number 37214.